It is amazing to look back and see how this organization has come so far from our first meetings to figure out how to help students and teachers in need in Northern Uganda. 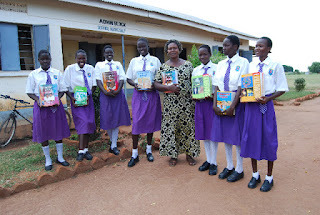 What started humbly as helping a boys' secondary school in Lira, and a girls' secondary school in Soroti, has multiplied into reaching the needs of 94 schools! Soon we will hit the 100 mark, which is not only hard to believe, but thrilling in its impact. Over 80,000 children have had new textbooks in their hands and improved their chances to pass on to the next grade level! Here in California, we have the Williams Act, which guarantees that each child will have the textbooks being used. Uganda is far from this goal and our wait list continues to grow. Can you imagine growing up without access to books? I sure can't. Books give us a peek inside places we may never see, ideas we may never have considered, and a chance to dream about marvelous things. Join us at the Granada Theater, Friday, April 19, 2019 for a gathering of people interested in Uganda. 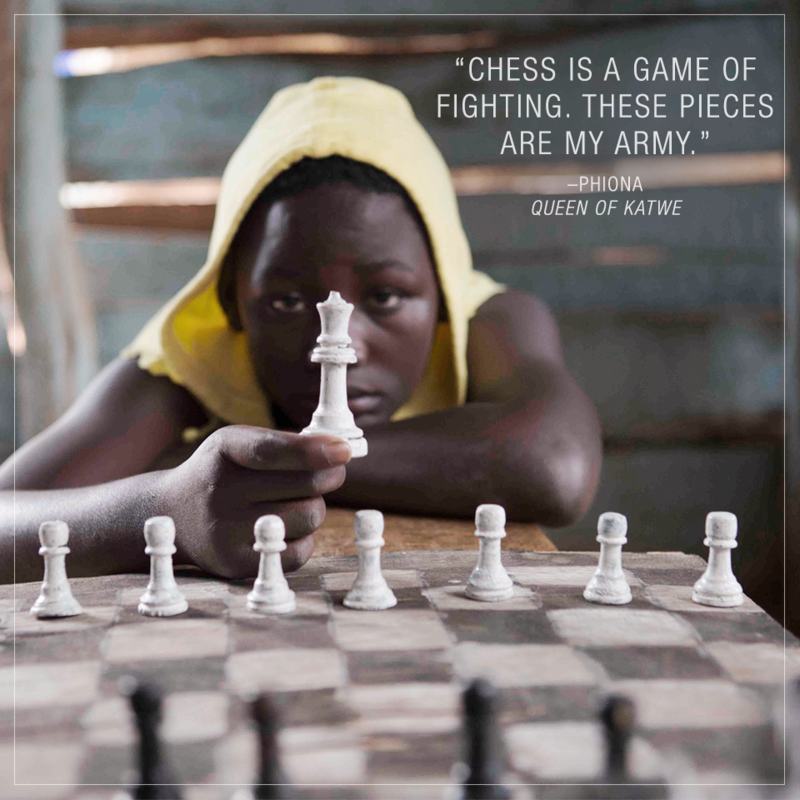 We will be treated to a showing of the Queen of Katwe, the wonderfully true story of a girl from the slums of Kampala, who overcomes her surroundings to become a National chess champion! July 2013 (Please help us by telling your friends about our site)! 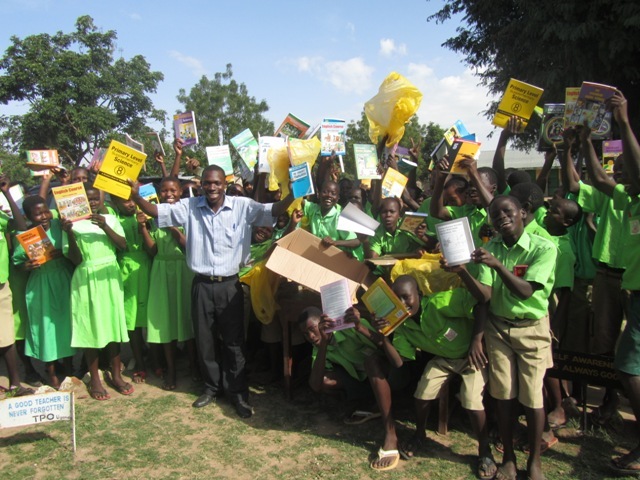 This year with a sizable donation from an anonymous donor ten schools in the districts of Arua (near the northern border with Congo), and Soroti (centrally located) received book assistance. This brings the number of schools we have helped in Uganda, to 50! All books were ordered ahead of time so that they could be delivered during Vicky’s visit to the area. In every case, the school held an assembly and students, teachers and at times parents on the P.T.A. and local officials came to witness the handover of the textbooks. Speeches were made, songs were sung by the school children, and their National Anthem was sung. For some schools, students had never seen a white person before due to the remote locations. 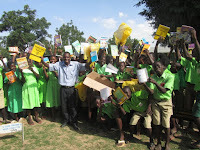 In all the schools, teachers and administration were overjoyed at having new books. Something as simple as a book, so common here in America, is just not available as a resource. Without a book, the teachers do not have a sequence of lessons to work from that correspond to what students will be tested on at the end of the year. They can work from memory, and often do an amazing job with very little. However working from memory has its limitations and when it comes to helping students to graduate from Primary and go on to Secondary, or Secondary and go on to Technical School or University, fewer and fewer students are able to keep up. A goal of the UN is for all children in African countries to achieve a primary education by the year 2015. This is a challenging goal, as 70% of students in Uganda drop out of school before completing their Primary School education. Uganda has the lowest rate of school attendance through P7 (the end of Primary) among all African countries. ! 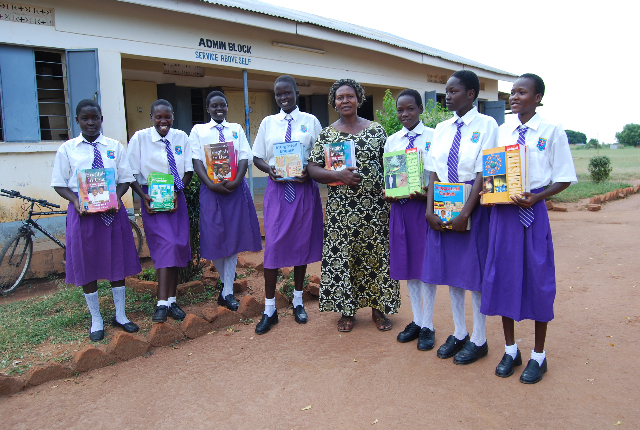 For the ten schools in Arua and Soroti, life has just changed. A large box of carefully selected textbooks has arrived, and teachers are eager to begin using the new lessons to work with the children. Books teachers have selected have been chosen in English, Literature (classics), Math, Science, History, Geography, and other areas as well. One exciting thing about Arua, is the connection with a thriving Rotarian group. They have already been instrumental in putting in latrines and water tanks in some of the schools, and since education and literacy is one of their main tenets, Rotary has agreed to monitor the progress of the schools now that the books have been in place. This partnership with the Rotary of Arua will help us to understand why some schools are making significant progress, while others seem to be taking more time to see growth. In human terms this means that a total of 12,730 students will have better opportunities this year to have access to curriculum that is current and focused on topics they should be learning in their communities. And 250 teachers now have access to new material to help them craft lessons that will prepare these students to become the country’s more educated next generation. In one two week period, that is a great accomplishment. Of course there are challenges are many for students: learning to speak English (as classes are supposed to be taught in English), dealing with hunger (for many they come to school on an empty stomach and eat their only meal at school), suffering from illness, (malaria is rampant, HIV, AIDS, dysentery, and even cholera), having to work to support their family while in school, caring for siblings, and living in single parent homes or even as orphans. Helping students to navigate through these challenges is vital for teachers, who have their hands full with their own troubles: class sizes of 80-100, not being paid for months by the government, being transferred from one school to another, and living with the same poverty as their students. With this in mind, Turn the Page Uganda also hosted two dinners for fifty educators and local officials in both Arua and Soroti. The purpose was two-fold. First, to honor the educators for the hard work that they do, and tell them that we recognize that teachers are a powerful influence on the future of their students. Administrators and teachers set the stage for how a school will be viewed by their constituents. With a strong team in place, students understand that school is a place where learning can be achieved and their dreams for a better future can come true. 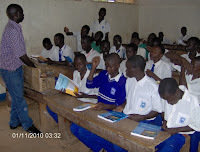 Our second goal was to bring people interested in Ugandan education together to have a common dialogue about how instruction is currently working in their schools, how the books they do have are being utilized, how the testing results were for this year, and what their worries are for the future about these issues. Finally, discussion led into plans for what could be done to lead teachers into having more success. By using a thinking routine from Harvard University, teachers were able to discuss in depth their personal viewpoints during the course of the evening. As an observer to this process, I was excited to see how eager the Ugandan teachers were to learn new “western methods” of brainstorming, working together in teams, wrestling with various opinions and selecting those that seemed to filter to the top as most important. Rotary members were included in Arua, so they would understand the plight of the teachers. 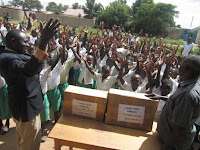 Local educational officials were included in Soroti for the same reason. While in Arua, I was invited along with Gloria Achoa, our Rotarian contact, to speak on a local radio talk show called the Radio Voice of Life, for an hour. We discussed the concept of Turn the Page Uganda, and what Rotary had been doing in the local schools to improve sanitary conditions. The schools that were receiving books were announced and a schedule for visitation was given so that parents could come to their school if they wished to view the transfer of books. During a call-in section we received a few calls of thanks, but also a few calls expressing frustration. People wanted to know why their school was not receiving the books. While we were able to explain that we were working in schools Rotary had a relationship with, I also expressed that I realized the great need all over Northern Uganda for this kind of support and that it just took me time to gather enough financial support from my friends in the U.S. Looking into the future Turn the Page has a few challenges to meet. 1. Seventeen schools remain on our list from last year. They have requested books, but have not yet been helped. A little money remains from the initial anonymous donation that could be used to help a few more of these schools if we were to go forward on our list. 2. 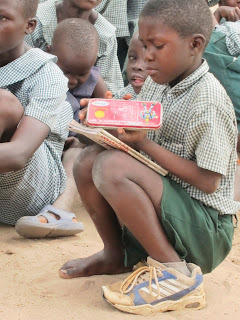 Almost every school we have helped has requested more books, as their student populations are quite large and no one else is helping them at this point to receive additional books. 3. Rotary leaders in Arua have more schools they would like to refer. The contacts we have in Lira and Soroti also have more schools to recommend. 4. Raising money in Santa Barbara, while not impossible, continues to be a challenge due to so many competing non-profits. •We also have some helpful partnerships developing. Our work with Rotary in Uganda is a beginning of what could morph into a much bigger opportunity. The contact Gloria just returned from the International Rotary meeting in Lisbon, Portugal, and she is willing to contact people she met in Rotary to see if they can offer assistance. •Another is our partnership with Unite to Light, a Santa Barbara group that provides portable solar lights perfect for teachers and students to use at night, in a country where electricity is often shut off, and people are forced to use oil lamps, which emit toxic fumes. Their President and I have discussed looking for grants where lights and books might go hand in hand. 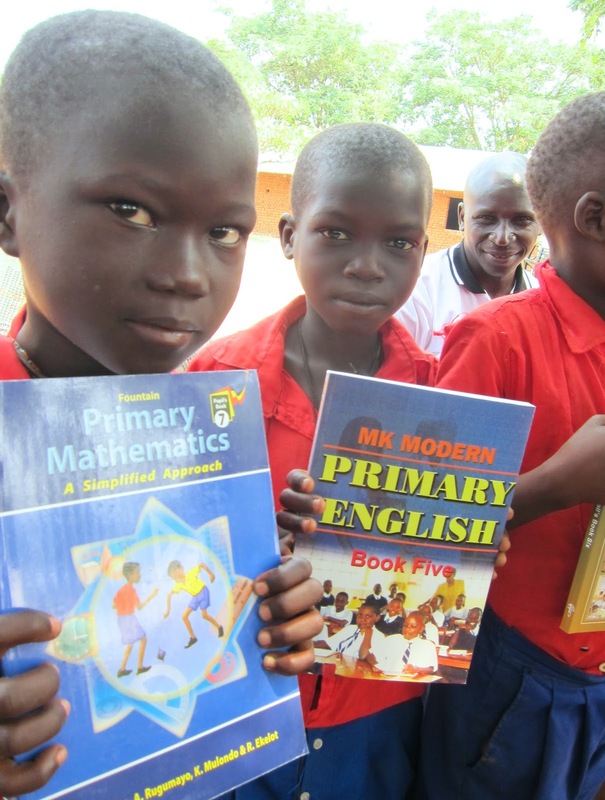 We have received the book orders for 6 more schools up in the Gulu area of Northern Uganda. I am excited to be working with these schools because they are all Sports Outreach Schools, created when the children were first congregating around Gulu for protection from the Lord's Resistance Army. Sport's Outreach saw the need for shelter, then the need to feed children, and finally the need for education. They began these schools and created daycare so that children would have a safe place to be while their parents were at work. My friend Aloysius Kyaze and his wife Esther have been in the North working with these children for a few years now and growing these schools. This is our first time sending books to Nursery age children, who also can benefit by seeing text and hearing the printed word. Books should be arriving shortly at Lagutu Nursery and Primary School, Koro Daycare & Nursery School, Lajwatek Daycare & Nursery, Pugwinyi Daycare & Nursery, Awach Primary, and Brozy Nursery School. We have raised enough money in the first half of the year to purchase books for ten more schools! Thank you to our individual donors as well as the Joseph Drown Foundation. We are working with individual schools in Lira and Soroti, Uganda. 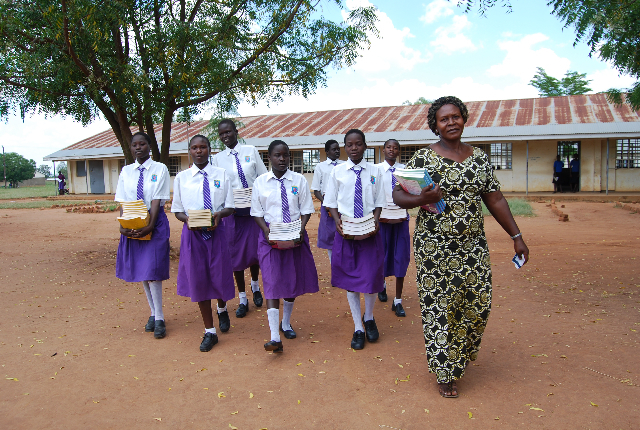 As of 2007 Lira had 349 primary schools with an enrollment of 149,814 students, 18,199 of whom are orphans. Their teacher: pupil ratio was 1:50, but the classroom: pupil ratio was 1:89 with an average of 8 students per desk. Not surprisingly, the drop out rate is significant. 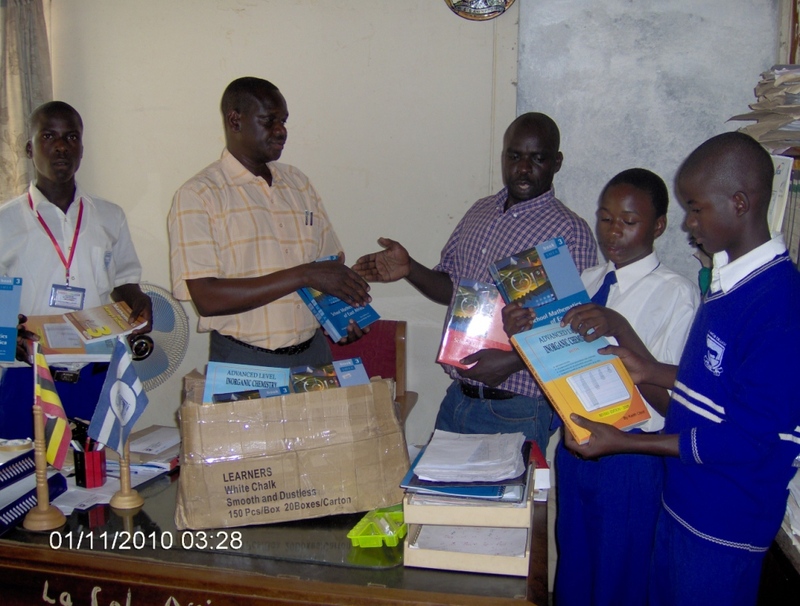 Bethany School is the second school to receive books from Vicky's initial visit to Uganda in 2010. "We came up to the all girls High School where the students had assembled outside. Most of the schools held an assembly so that all the students in the school could see us. They welcomed us in a way no other school had done, by singing. It was absolutely beautiful. Their harmonies were amazing, not like the harmony one usually hears in the U.S. but the kind that you want to imprint on your heart forever. Together with their brilliant purple uniforms they made an impression that I just couldn't forget. After the assembly, the girls had a chance to mix with us and talk. They were delightful; open, cheerful, and not afraid to engage in discussion. Some of the younger members of our team enjoyed kicking around a soccer ball with some of the students. If we had been given more time, I would have wanted to spend the entire day with these girls. The simple idea that everyone is entitled to an education, something we take for granted here in the United States, is just not a reality in Uganda. Not all girls are able to attend school for a variety of reasons. I was excited to choose their school as the first girls' school to receive educational materials to support their meager supplies. 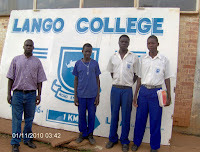 The first school to receive books during the summer of 2010 was Lango College, a high school for boys. With their money they mostly purchased science books to help the boys prepare for the State exams.